Note: This article is based around inferences drawn from facts/evidence, but is not in any way an absolute source. Though all of these are educated guesses that I have spent a lot of time looking for evidence of (I went where the information lead me rather than trying to force the information into an agenda), I highly encourage everyone to delve into the game themselves and look for dialogue/knowledge! 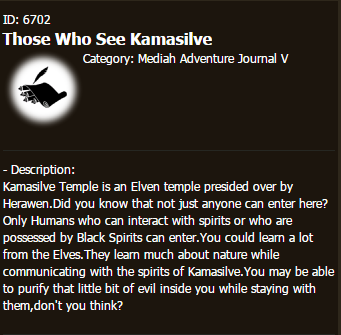 NPCs in the Kamasilve Temple explicitly state, among many things, that Elves simply think differently than Humans do. I found this very interesting, as it’s rarely something explicitly stated in fantasy universes and is usually something more implied. However, since it wasn’t explained directly to us, I began looking for evidence of what sort of implications this has—and have been studying Elves very closely since reading this. First off, we'll start where Elves themselves start: as Children. We get an interesting peek into the life of Elven children in the Longleaf Tree Outpost, where a few things become apparent immediately. Right away, we see a great many of these children acting very maturely—much more so than you’d expect from kids who look to be no more than 9-10 years of age. They discuss the intricate workings of battle strategies, lament the lack of understanding others have for them and how they feel suffocated in their environment (similar thoughts typically appearing in teenage years in humans), and are overseeing the recuperation of injured adventurers they’ve taken in while giving orders much like a trained medic, and we learned that they will be punished if they are found playing. But they still do play, and it's clear that they're still children. Mirroring human children, we also see them lacking understanding and wisdom as well. They seem to make very understandable-for-children mistakes in logic and action, not quite understanding how maps work, being fairly gullible, and making child-like conclusions from time-to-time. We also see them disobeying and playing hide-and-seek instead of doing what they’re told, we see them crawling on tables and giggling and telling stories. So we can see that they're like human children in many ways, but they appear to develop in certain ways different than human children in terms of mentality. They are evidently much more emotionally sensitive and aware, as well as being able to grasp complex concepts such as battle strategies. Similarly to human children, however, they like to play and pretend, are likely to disobey if it means having fun, and still in many ways act “childish”. In many ways it would seem that Elven children, due to their maturity, are treated as mini-adults in terms of responsibilities. In this sense they mirror Shai in many ways (including appearance). It is evidently acceptable for an Elven child to be in a semi-dangerous environment, we see them being permitted not even 30 feet away from giant flying Gargoyle monsters that are being fought off by the adult Elves, which may also reflect Elven treatment of children. In many ways it would seem that Elves are culturally “tougher” parents, likely due to the fact that the children are more mature and can likely be given more responsibility. However, they do still defend their children. These same children are told that they aren't ready for battle, and are kept relatively protected. This is not to say that humans are not sometimes "tougher" parents in a similar scenario, but only in very rare cases are children given responsibilities such as the main practitioner of medicine or trade management—whereas we see it quite often for Elves. This development seems to take a different turn, however, once they reach adulthood. They don’t lose progress by any means in terms of maturity, but it seems to slow once they reach comparable-to-human levels. Instead their development seems to shift towards even more sensitivity. As adults, we see they are more able to inherently tune into the world of magic, have higher degrees of sensitivity to it, and can tap into frequency other races can’t due to their affinity. This is reflected in the knowledge blurb of Orwen, where we learn that Elves can inherently sense Ancient Energy, and only Elves have the ability to directly channel it. It’s likely that this magical and spiritual proclivity doesn’t just end with Ancient Energy, as said above we learn that their intensely magical homeland is perhaps connected in some way. This theory is also supported by the Kamasilve Temple's nature/rules, in which we learn that only humans who can interact with spirits (or are possessed by Black Spirits) can enter, and they are not permitted to speak about what they've seen inside. It would seem that considering Elven history (translated link below for the Ranger's Awakening) also points to the idea that Elves can naturally interact with spirits. I get the impression that many of them are a bit hyper-focused and plenty come off as "strange" and/or "intense", such as Kanna of Glish who has dressed herself up in a large Naga suit. Now this isn’t to say she is wrong in any way, because most can agree that Kanna is right. Nagas and Humans working together would certainly benefit both, and it’s wrong to mercilessly hunt and kill Nagas. It’s more that her method of approaching the subject is not immediately understood by outsiders (particularly Humans, I’d imagine), and instead she looks like a bit of a fanatic. Elves seem to be very driven and have a strong and apparent focus when well-known. 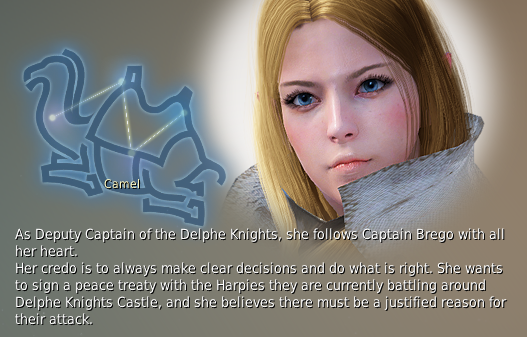 Maragaret is one of two Elven women in the Delphe Knights, and she focuses on her devotion to the order. How strongly? That she immediately asks an outsider who she doesn’t know at all to help her keep the bureaucracy flowing while they're being sieged. 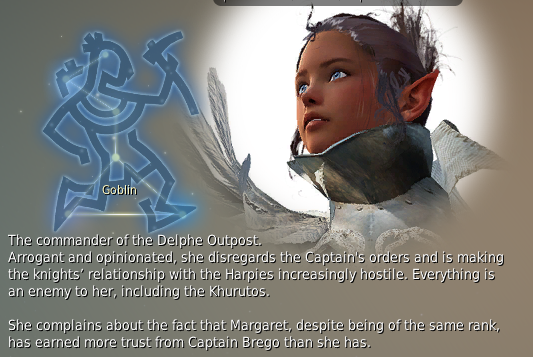 Her Knowledge article even says: “she follows Captain Brego with all her heart. Her credo is to always make clear decisions and do what is right.”. Elgriffin is the other of the two Elven women in the Delphe Knights, and her severe hatred of Harpies is actually making things worse for everyone. She despises Harpies and Khurutos, and may have been the one to actually start the war with the Harpies as she took it upon herself to slay the last Harpy Queen. Her focus is her hatred of these beings and her own superiority. In terms of religion and spirituality, we see Leona and Gray Biants—once again, complete focus and dedication that defines their very sense of self. 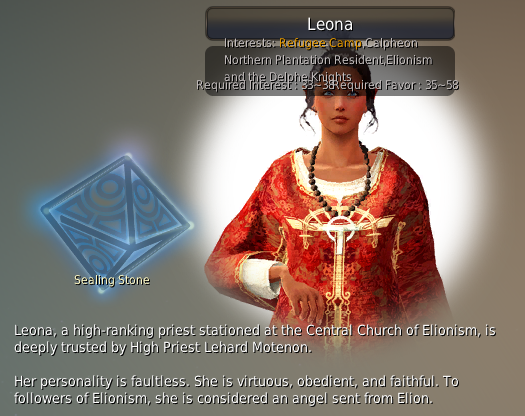 We also see the Leights, who are said to be “Angels sent from Elion” (much like Leona, see a pattern?) due to their focus on good deeds, charity, and helping those in need. 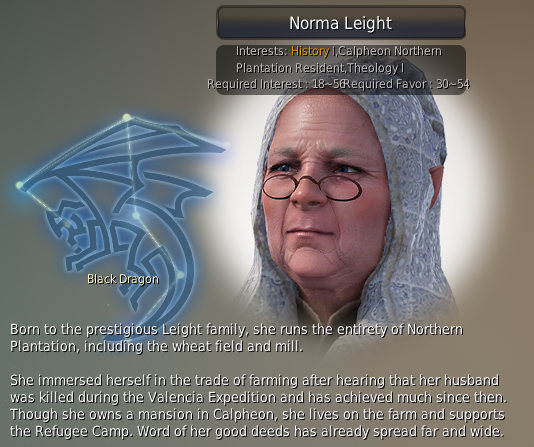 We see from Norma Leight that she is particularly adamant about this, as she goes above and beyond to the point of giving up her mansion to create a farm—to which she sends much of its produce to the Refugee Camp and the poor in Calpheon. 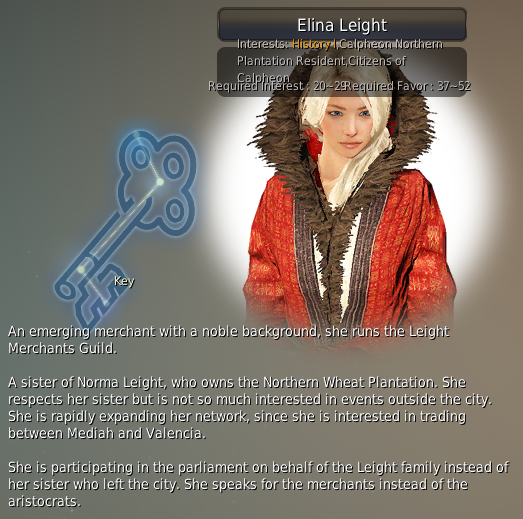 Elina Leight admires her sister Norma, but instead has a major focus in mercantile business in Calpheon. She represents the merchants, and all of her mentioned goals (trade with Mediah and Valencia, for instance) have to do with mercantile endeavors. The Priestess Nellamorin? Loves nature and is adamant about preserving nature. The Priestess Lunia? Actively trying to stop the spread of Hexe Sanctuary’s curse and sees it as her sole duty despite only being tangentially affected. Dyleoyen? Believes she belongs on the frontlines of battle despite being told she isn’t ready yet. Luwensley? A wild-tempered Elf (we see this in a few, including Elgriffin) who is calmed by Nelydormin’s influence and highly values information and knowledge, and trades information with a trained hawk. Martha Kiyen? Head archaeologist who does nothing but research, and more-or-less strongarms her way into the Bree Tree Ruins due to her fascination with them. Alone, one could say they’re just driven individuals. But when analyzed as a group, we see an Elven behavioral pattern. This complete focus on a particular goal is likely why we see Elves in religious positions, as it gives them explicit instructions, method, and purpose. 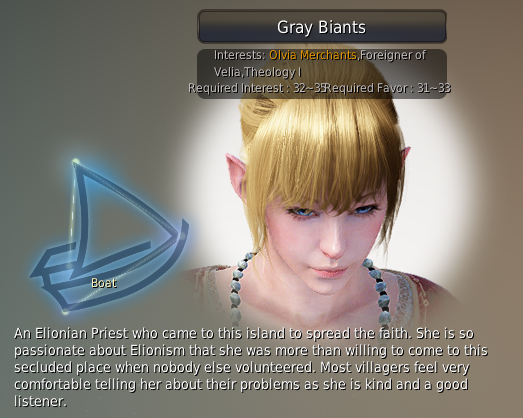 We see a huge number of Elven Priestesses of all religions (Elionism, Kamasylvian Beliefs, Aalism), as well as fitting in nicely with bureaucracy and established systems (The Delphe Knights and Mercantilism) and naturally excelling at such. They are evidently drawn to structures in which they can pursue their focus. In certain cases, the structure itself becomes said focus. Elven Culture seems to reflect their mentality, in that it is extremely motive-based and active rather than something more slow and reactive that we see in the majority of Human societies. In many ways Elven culture can be looked at as "factions" and "sub-factions", which helps us as non-Elves understand them better. There is a noted cultural divide we don't know much about in Kamasylvia, but we do get a short peek into the them through the "Beniteu" (the current translation) which are wildly different from any Elves we've seen. They're apparently "strange and aggressive" types of elves. Their style of clothing is different, and entirely the opposite of what you'd expect from Elves if you only knew the ones we see outside of Kamasylvia. 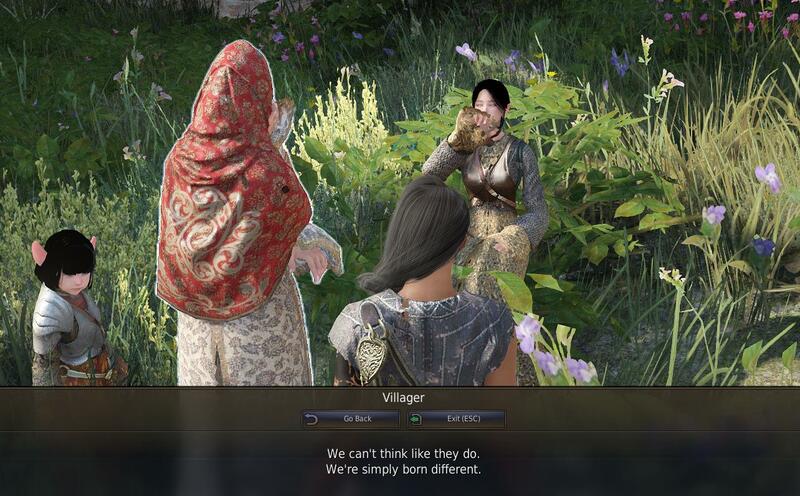 Similarly, we don't know if there are even more cultures and ethnic groups within Kamasylvia. The largest sweeping statements we can make about Elven culture, is that the Herawen-followers (likely the majority of Elves) revere nature, peace, harmony, and balance. The creation myth of Kamasylvia has been translated by Jariana here. Kamasylvia is the country's name. There is an Elven Goddess, and her name is Sylvia. Kamasilve is a different entity than both Kamasylvia and Sylvia. It's the Elven sacred tree of power created by the Goddess Sylvia. The "Ranger" class is tied to the historical army that defends Kamasylvia. 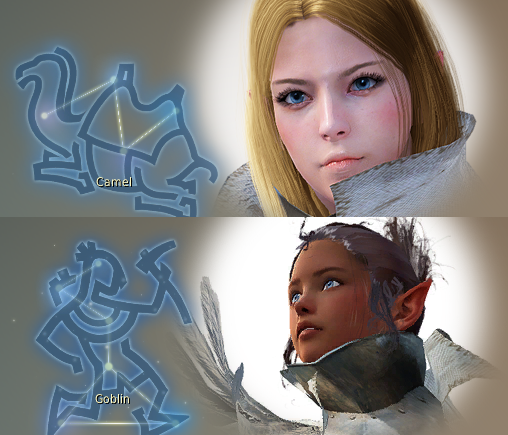 Elves seem to have an intrinsic division, based on Light/Sun and Darkness/Moon. This seems to be tied to ancestry, as the descendants of the Sun-Daughter and the descendants of the Moon-Daughter seem to follow different ideologies. We don't know yet if this divide still exists, if the only remaining Elves are the descendants of the Sun-Daughter, if there are groups who splintered off, and so-on. We do know, however, that Herawen and Verolina (Braulina, Berolina, Vraulina, we don't really know her name so I choose to go with Verolina) are descendants of the Sun-Daughter. The "Sun" Elves sought to live in harmony with the spirits/elements, these are likely the ones we see. The "Moon" Elves sought to dominate/control the spirits/elements, these may be the "Dark Elves" we've recently heard of, or another group entirely. The "Moon" Elves seem to have booked it after the civil war, whereas the "Sun" Elves stayed with the tree. These "Moon Elves" sought a different source of power than Kamasilve. It would seem, then, that Elves even at home have larger overcultures which embody specific ideas or principles. It's in this sense that I believe we see the largest divergence from human cultures. Whereas Human cultures are more well-rounded and vague in their direction and purpose, only changing over time without any direct purpose beyond subcultures/movements—the entirety of Elven cultures in of themselves seem to have a direct goal/motive and retain said goal/motive. Once again, much like a "Faction" or "Subculture" rather than something you'd consider a culture, which gives us some interesting implications as well. It is clear that Kamasylvian art/clothing will reflect what their culture embodies. We see this with Herawen-following elves decorating with plant life, flowers, leaves, animal bones, white/light aesthetics, green aesthetics, and leaf motifs everywhere. In fact, even the Ranger class's outfits reflects these principles the Rangers as "Keepers of Wind" who focus on air spirits and wind magic. As Herawen-followers, they naturally will have leaf/nature elements as well. In fact, we can directly predict what elements the Ranger's clothing/weapons will use based on the principles they follow. 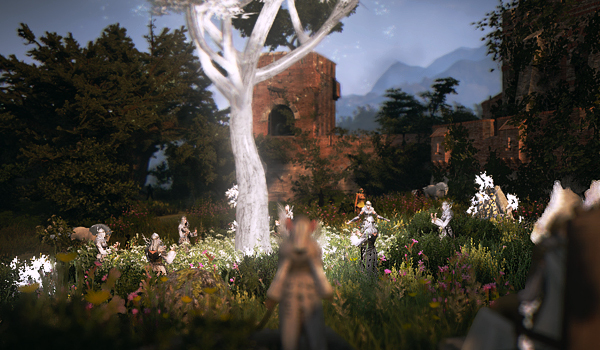 You can likely look at many Kamasylvian Elves and figure out what their motives/roles are immediately based on the symbolism used on their clothing. While some human societies use semi-similar methods, they are never as total and universal as the way the elves we've seen so far present themselves and decorate. Obviously outside of Elven societies, Elves will dress more like the locals and whatever clothes are available to them. Similarly, we see that Herawen's plant-focused priests at the Kamasilve Temple literally wear pieces of plant life on their bodies. Even the Longleaf Tree Sentry Post priestesses wear leaf-decorated clothing. "Dark Elves", described as "aggressive" also seem to fit the bill with the usage of roses (what is it that "every rose has..."? ), spikes, and thorns (bingo) on their armor and clothing from what we can see in one picture. We know nothing about them, but this begins to paint a fairly clear picture that fits in perfectly with the class as described. Aggressive and peculiar, but certainly Elven. 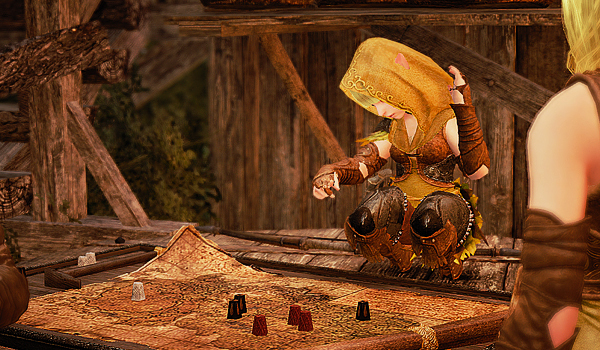 An Elf is often absolute in their dedication, which explains why not a single (traceable) elf who has left Kamasylvia has divulged the "secret of their land" on why they're even leaving in the first place. This isn't to say that an Elf may not have said something, after all their personal beliefs may conflict with that sort of censorship, but it is much more telling in that so many have said nothing, to the point that nobody knows what is going on there. That kind of solidarity is unseen in Humans who aren't at all related to one another and have spread out over the world, and makes sense when we realize that all of the Elves we see are from the same culture-faction, and thus are more likely to do what they're told—especially by a total-authority figure such as Herawen, who is essentially the embodiment of their culture and ideals. It is best to understand the Elven Mentality by looking at our Human experiences and finding common connecting points. There are people in our lives who are driven to the point of complete dedication by their morals or motives, there are movements/subcultures which have particular goals or ideas in mind, and sometimes we have children who are particularly gifted in terms of maturity and understanding. The difference with Elves seems to be that this is more normal and less exceptional for them. They are still just as diverse as humans—still just as capable of great good and horrific evil. They simply seem to approach the world slightly differently than your average Human. We will likely learn much more when Kamasylvia releases, and so I'd like to consider this a "living document" that may change/evolve over time as we get more information. Thank you for reading!